Childhood is undergoing a revolution. The philosophy of bringing up children as separate from adults is a thing of the past. In pre-schools, more and more attention is being paid to designing spaces that accommodate the very young and meet their needs in a way that fosters dialogue and communication. When it comes to home life, busy parents want to spend free time with their children that they will both enjoy. Children are no longer just tagging along and fitting in, they are being provided for with spaces that are stimulating, fun, imaginative, peaceful, or just plain practical. Children are no longer adults in waiting – they have their own culture, and contemporary children’s interiors are very much about defining the way childhood is being designed in the twenty-first century. 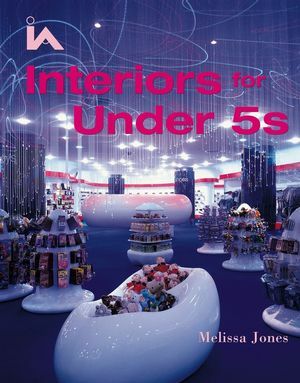 This book showcases a wide variety of interiors designed for the very young from around the world. These range from creches, nurseries and preschools, to museums, restaurants, bedrooms, playspaces, shops and hotels. Each architect or designer has given considerable thought to making their space – whether public or private - workable and beautiful, and their approaches are inspirational. If you are looking for design ideas, or just want somewhere great to take your child at the weekend, this is the book for you. Melissa Jones is a novelist who lives and works in London. She was educated at Westminster School and Oxford University. She worked in film and television before becoming a writer. She has published two books, Cold in Earth and Sick at Heart, as well as numerous articles. She is married to an architect and has a four-year-old son. Jubilee School, Tulse Hill, London. De Kleine Kikker Day Care Centre Utrecht, Holland. Swiss School Kindergarten, Barcelona, Spain. Migrants Resource Centre Créche, Pimlico, London. Hoyle Early Years Centre, Bury, Lancashire. Workbox Desk, Staten Island Public Schools, New York. Jigsaw Day Nursery, Wandsworth, London. Münster Parish Kindergarten, Ingolstadt, Germany. Fawood Children’s Centre, Harlesden, London. The Pattern Pod, Science Museum, London. Museum of Childhood, Bethnal Green, London. Dulwich Picture Gallery, Dulwich, London. Climbers and Creepers Children’s Zone, Kew, London. Roald Dahl Gallery, Aylesbury, Buckinghamshire. Roald Dahl Museum, Great Missenden, Bucks. Discover children’s centre, Stratford, London. Discovery Center, American Museum of Natural History, New York. Blue Kangaroo Restaurant, King’s Road, London. Hotel Tresanton, St Mawes, Cornwall. Twenty-first Century Tree house, London. St Mary’s Garden hall Wimbledon, London. Selfridges Kids, Oxford Street, London. Babington House, Midsomer Norton, Somerset. Pavilions in the Park, Horsham, Surrey. London Aquarium, South Bank, London. Bedroom and Bathroom Floor, Kensington, London. Evelina Children’s Hospital, Lambeth, London. Private Bedrooms and playrooms, Notting Hill, London.